The month of June is dedicated to the Sacred Heart by Holy Mother Church. The Church, governed and taught by the Holy Ghost, has approved and recommended devotion to the Sacred Heart of Jesus. In our age of religious indifference, when fervor and charity have grown cold, Jesus exhibits to the world His Sacred Heart as the symbol of God's infinite love - the symbol of His own generous self-sacrificing love for men. Jesus shows His Divine Heart as a furnace whose burning rays of love are able to reanimate faith and rekindle love in hearts grown cold and ungrateful. But why His Heart? Because in every language, in every age, the heart is regarded as the natural symbol of love and affection. 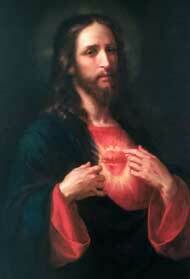 What more natural and expressive symbol is there, then, of the excessive love of Jesus than His Sacred Heart? 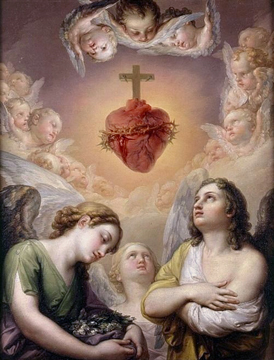 The direct and material object of devotion to the Sacred Heart is the real, physical Heart of Jesus - the Heart of flesh, the living and loving Heart of our Blessed Lord; the Heart that beat in His Divine breast at the moment of the Incarnation; the Heart that loved us during the life of Jesus on earth, that poured forth its blood to the last drop on Mount Calvary; the beatified Heart now glorious in Heaven and still dwelling among us in the Blessed Sacrament; the Heart ever united to the Person of the Divine Word, to whom is due supreme homage and adoration. 54. ...the Heart of the Incarnate Word is deservedly and rightly considered the chief sign and symbol of that threefold love with which the divine Redeemer unceasingly loves His eternal Father and all mankind. 57. And finally – and this in a more natural and direct way – it is the symbol also of sensible love, since the body of Jesus Christ, formed by the Holy Spirit in the womb of the Virgin Mary, possesses full powers of feelings and perception, in fact, more so than any other human body. 59. Hence His words, actions, commands, miracles, and especially those works which manifest more clearly His love for us – such as the divine institution of the Eucharist, His most bitter sufferings and death, the loving gift of His holy Mother to us, the founding of the Church for us, and finally, the sending of the Holy Spirit upon the Apostles and upon us – all these, we say, ought to be looked upon as proofs of His threefold love. 60. Likewise we ought to meditate most lovingly on the beating of His Sacred Heart by which He seemed, as it were, to measure the time of His sojourn on earth until that final moment when, as the Evangelists testify, “crying out with a loud voice ‘It is finished’ and bowing His Head, He yielded up the ghost.” Then it was that His heart ceased to beat and His sensible love was interrupted until the time when, triumphing over death, He rose from the tomb. We consecrate ourselves to the Sacred Heart by acknowledging Him as Creator and Redeemer and as having full rights over us as King of Kings, by repenting, and by resolving to serve Him. We make reparation for the indifference and ingratitude with which He is treated and for leaving Him abandoned by humanity. To carry out these general goals of consecration and reparation, there are quite specific devotions authorized by the Church. 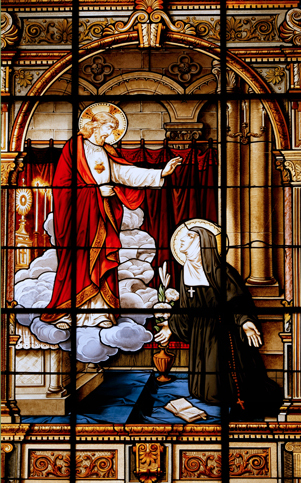 General devotion to the Sacred Heart, the birthplace of the Church and the font of Love, were popular in Benedictine and Cistercian monasteries, especially in response to the devotion of St. Gertrude the Great (b. 1256), but specific devotions became even more popularized when St. Margaret Mary Alacoque (1647-1690), a Visitation nun, had a personal revelation involving a series of visions of Christ as she prayed before the Blessed Sacrament. She wrote, “He disclosed to me the marvels of his Love and the inexplicable secrets of his Sacred Heart.” Christ emphasized to her His love and His woundedness caused by Man's indifference to this love. 1.He will give them all the graces necessary in their state of life. 2.He will establish peace in their homes. 3.He will comfort them in all their afflictions. 4.He will be their secure refuge during life, and above all, in death. 5.He will bestow abundant blessings upon all their undertakings. 6.Sinners will find in His Heart the source and infinite ocean of mercy. 7.Lukewarm souls shall become fervent. 8.Fervent souls shall quickly mount to high perfection. 9.He will bless every place in which an image of His Heart is exposed and honored. 10.He will give to priests the gift of touching the most hardened hearts. 11.Those who shall promote this devotion shall have their names written in His Heart. 12.In the excessive mercy of His Heart, His all-powerful love will grant to all those who receive Holy Communion on the First Fridays in nine consecutive months the grace of final perseverance; they shall not die in His disgrace, nor without receiving their sacraments. His divine Heart shall be their safe refuge in this last moment. 2.First Fridays: going to Confession and receiving the Eucharist on the first Friday of each month for nine consecutive months. Many parishes will offer public First Friday devotions; if they do, you must perform First Fridays publicly. If it isn’t so offered in your parish, you can do this privately, going to Confession, receiving the Eucharist, and offering your prayers for the intention of the Holy Father. 3.Holy Hour: Eucharistic Adoration for one hour on Thursdays. (“Could you not watch one hour with me?”) Holy Hour can be made alone or as part of a group with formal prayers. The Friday that follows the Second Sunday after Pentecost is the Feast of the Sacred Heart which brings to mind all the attributes of His Divine Heart mentioned above. Many Catholics prepare for this Feast by beginning a Novena to the Sacred Heart on the Feast of Corpus Christi, which is the Thursday of the week before. On the Feast of the Sacred Heart itself, we can gain a plenary indulgence by making an Act of Reparation to the Sacred Heart. Father Mateo Crawley-Boevey, a South American priest of the Congregation of the Sacred Hearts of Jesus and Mary, was inspired by God, after his instantaneous cure at Paray-le-Monial, to preach everywhere the Enthronement of the Sacred Heart to verify this promise of the Savior given to St. Margaret Mary: "I will bless every dwelling where an image of My Heart is both exposed and honored." According to Father Mateo: The Enthronement is the Official and Social Recognition of the loving Kingship of the Heart of Jesus in a Christian family. This recognition is made manifest by giving the image of the Sacred Heart of Jesus a place of honor in the home which is thus solemnly offered Him by an act of consecration. The God of infinite mercy said in Paray-le-Monial: "Being Myself the fount of all blessings, I will distribute these abundantly wherever the image of My Heart has found a place, to the end that it may be loved and honored." And further: "I shall reign in spite of My enemies and all those who attempt to oppose Me." The Enthronement then is simply the realization, not of this or that one of the requests made by Our Savior to St. Margaret Mary, but the complete and integral realization of all of them, calling forth the fulfilment of the splendid promises with which the King of Love has enriched them. Note that we say "integral realization of all the requests made in Paray, for the supreme end of the Enthronement is not, and ought not to be, to further a new pious practice, but to sanctify the home, and convert it into a living and social throne for the divine King." During the Enthronement ceremony, a blessed image of the Sacred Heart is hung in the most prominent place in the home, and Sacred Scripture is placed before it. Formal prayers are prayed and then each member signs a certificate of the Consecration.